Betty Fox was 71. She was Terry Fox's mom and she nurtured his legacy into one of international action and inspiration in the fight against cancer. Every year I raise funds here and run in the Terry Fox Run. This year, I won't just be running for Terry, I'll be running for Betty, too. This morning's Terry Fox Run at High Park was a great success. It was the biggest crowd in years, and our mayor, MP and MPP all came out in support of this awesome cause. Thanks to 26 of you, I managed to raise $1,187, a personal best. It's actually not too late to bump that a little. Donations are still being accepted. Thanks again, everyone. We'll do this again next year. 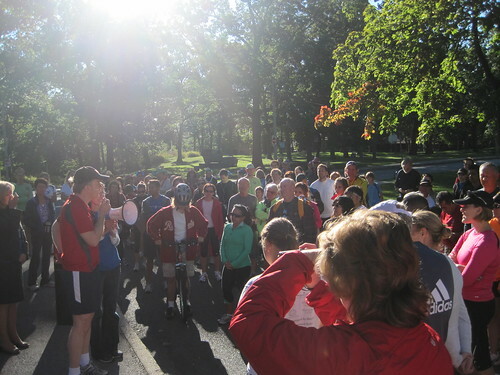 Tomorrow morning, I'll be at High Park for the 2010 Terry Fox Run. Many of you have already pledged, and I sincerely thank you. You'll be getting an email from me tomorrow. The rest of you stragglers still have time. Donate to my run and they'll email you a tax receipt in PDF. It's easy, secure, for a good cause and I'll owe ya a favour. 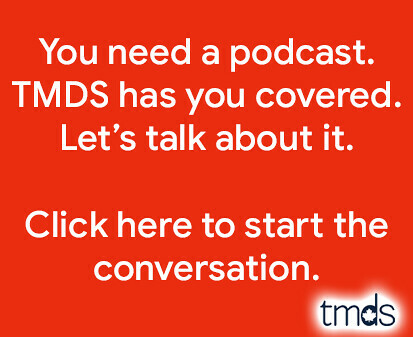 Whip out those credit cards and click on over! I'm running for Terry on Sunday, September 19 at High Park. I'm aiming to raise $1000 for The Terry Fox Foundation. I'm really going to need your help. Donate to my run. They'll email you a tax receipt in PDF. It's easy, secure and for a good cause. This one is a few days old now, but it's worth an entry. Meredith Vieira, who was on NBC talking about Betty Fox, speculated that as mother of "Michael Fox…who suffered from cancer, he started that marathon of hope" she might actually be the person who would light the Olympic cauldron. I can almost accept the slip of the tongue, but the kicker is when NBC throws up a picture of Michael J. Fox to ensure Americans know exactly who Meredith Vieira is talking about. What a fantastic morning. The entire family got out of bed early to participate in the Terry Fox Run at High Park. My wife and kids were met there by my mom, my brother, his wife and their unborn child. That's right, there's an unborn child in the family. Cool, eh? David Miller was there as well, and I introduced myself as the guy he knows better as @torontomike on Twitter. He was joined by our MP Gerard Kennedy and our MPP Cheri DiNovo. The reason we were there was to keep going for Terry. That's why I've raised $645.00 thus far. Most of that came from readers of this blog, and for that I'm truly appreciative. You guys are awesome. It's not too late to sponsor me. If you can afford to give, click over to http://www.terryfox.org/cgi/page.cgi/Run/participants.html/GWJHRE and help pad my total. I promise warm thoughts in return. 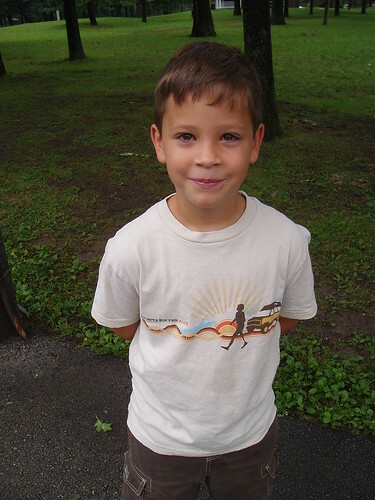 Terry Fox Run 2009 - Have You Pledged Me Yet? In four days I'm running in the Terry Fox Run. I'm aiming to raise $1000. I'm currently at $295. Donate now. If you pledge more than $20 you get a tax receipt right away. Also, I'll know you pledged my run and will always have warm thoughts about you. Do it for me. Do it for Terry. I'm running for Terry on Sunday, September 13 at High Park. I'm aiming to raise $1000 for The Terry Fox Foundation. I'm really going to need your help. Who has the courage to go first? What an awesome morning for the Terry Fox Run. It was warm, the sun broke through the clouds and the turnout at High Park was much better than last year. David Miller addressed the crowd before cutting the ribbon and starting this year's 4.5 km race. With a federal election next month, Liberal MP candidate Gerard Kennedy was there with the Green Party candidate, Robert Rishchynski. Although I saw her out last year, incumbent MP Peggy Nash didn't make an appearance. This wasn't about political photo ops. This was about raising funds and awareness for The Terry Fox Foundation. Thanks to your generosity, I ran with $749 in pledges. It was also my first Terry Fox Run with my son. James did great, hanging tough for all 4.5 km. It was more of a brisk walk than a run, but he was rewarded at the finish line with a bottle of water, a banana and chocolate chip cookies. Thanks, James, for joining the cause. We'll do it all again next year. 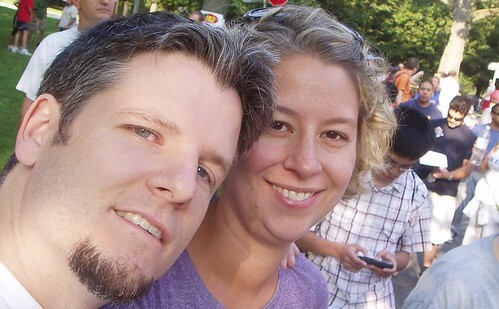 I'm running for Terry in High Park on Sunday morning. I've thus far raised $572 but I'd like to raise more. That's where you can help. 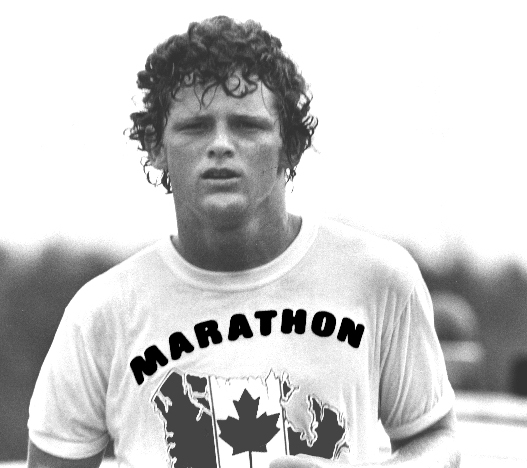 If you haven't yet contributed, pledge my run online and help me help the Terry Fox Foundation. It's really, really slick. You enter your credit card number, securely and easily, and your tax receipt is emailed to you as a PDF right away. Thanks to all who have already chipped in and to those who needed this final prodding.